If you’re reading this, it is likely you’re on a journey to becoming debt-free, already living a debt-free life, or just trying to get your financial act together – somehow. That’s awesome! You are challenging our culture’s norms of living a life saddled with debt! I paid off $74,000 of debt in two years. There are even greater and far more jaw-dropping debt-free stories out there. I am impressed and inspired each time I hear one – or of someone’s bold, audacious goal like having a paid-for home by 40, trading their home for traveling the country in an RV, or leaving a traditional career to become an entrepreneur. You don’t go on a journey to turn around a massive amount of debt or pursue those “crazy” goals without sacrifice. And if you’re doing it fast (or want to), the pace at which you reach your goals is pretty much dependent on how deeply you are willing to sacrifice, and how much focus and intensity you bring to your journey. For me, that meant no eating out, going to movies, buying clothes, or taking vacations during our two-year journey. It was completely worth it, and I don’t regret for a second, the level of sacrifice we chose or the pace at which we paid our debt. What I do regret, however, is not prioritizing some things that were just as important as paying off the debt – like making sure my family still had quality and rich experiences during those years. If I had to do it all over again, I would be more intentional about making sure that the sacrifice doesn't come at the expense of other important things in my life. While on your journey, you will have to make decisions on what will get the attention of your dollars and what will not. It’s worth taking a moment to make a mental list – or even better, a physical one (yay for the power of writing things down!) – of what you are willing to sacrifice and what you want to prioritize in your quest for debt freedom or debt-free living. Identifying those things provides a guide for you as you progress towards your goals and will allow you to look back at your journey with no regrets. Here is what I have learned (and am still learning) to prioritize and what I am okay with sacrificing on the path to debt-free living. Putting these things first makes for a “rich” debt-free life. Living frugally or debt-free doesn’t have to mean you neglect your relationships. You will never remember the movies you missed or the restaurants you skipped while on your journey, but you will feel – and regret – the effects of putting your money goals ahead of your relationships. While on the road to debt-freedom, be sure to prioritize the people that matter to you by finding creative and frugal ways to stay close and be there for them. It’s easy to struggle with generosity when it costs you money, and you’re trying to sling every free dollar you have at your student loans. Give up other resources that are in more abundance like your time or a skill that you have, but know when and be willing to part with your dollars if it makes a difference in someone else’s life. Living a debt-free life doesn’t mean living a life void of fun or quality experiences, although it can go in that direction if you allow it. Whether you’re single, married, or have children, be intentional about seeking out and providing quality experiences during your journey – ones that provide meaningful memories without derailing your progress to your goals. Besides the literal things to give up, here are some things to consider letting go. Now, I know many will disagree with me on this one, but I am okay with sacrificing my time (not other people’s) in some situations in order to save money. Time is money, so if you’re saddled with debt, then you have more time than you do money. Until the opposite is true, being willing to part with your time will allow your money to go where it needs to go. This is another one that others may not be willing to put on the chopping block, and it goes hand-in-hand with time. 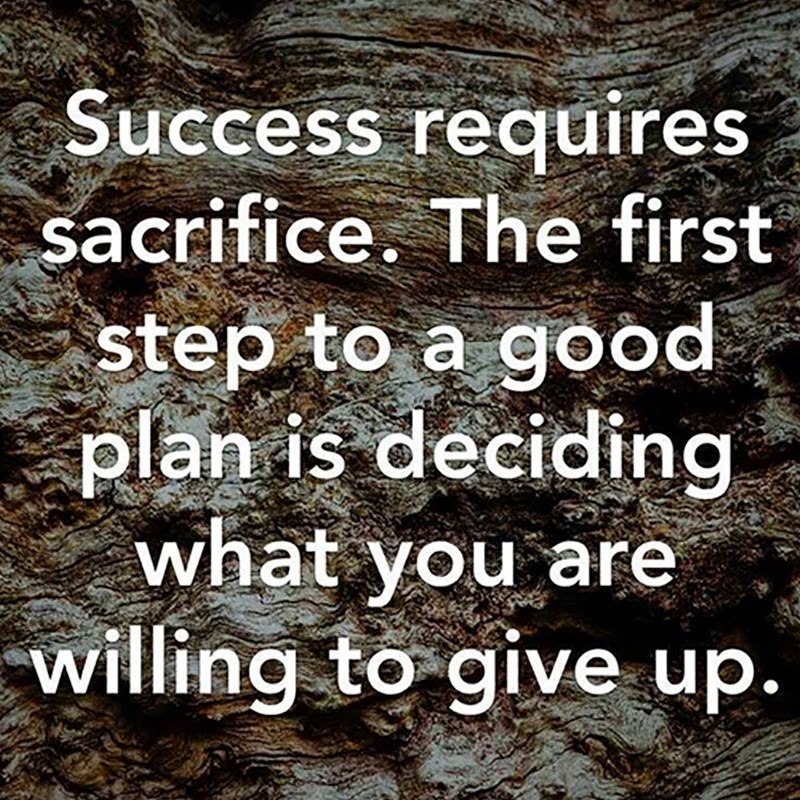 Convenience can sometimes come with high premiums so choosing to sacrifice it in order to meet your goals can be worth it. If I’m completely honest, I do care what others think. But I shouldn’t, and neither should you. This quote from Abraham Lincoln sums it up well, “Character is like a tree and reputation like a shadow. The shadow is what we think of it; the tree is the real thing.” Because living a debt-free life is completely against our culture, some people in your life will question your choices. The Joneses may look down their noses at you, but as long as your character and priorities are in check, who cares? Even though I have achieved my goal of becoming debt-free, I am still very much on my financial journey, and continue to learn how to navigate it in a way that I can reflect upon positively. While on your journey, I encourage you to strive for and live a debt-free life that you are proud of – one that is rich with experiences, quality relationships, and no regrets. Your turn. What do you need to prioritize, and what are you willing to sacrifice on your journey? Great reminder to be purposeful in the journey out of debt. It’s alright to make sacrifices, but you need to be aware of them and decide that they are not a priority right now. Otherwise, you probably will regret the things you didn’t mean to neglect while straightening out your finances. Absolutely. It’s too easy to let that happen if you haven’t defined your priorities. I wish I didn’t have to learn that the hard way! Thanks for sharing your story. Quite impressive turnaround in two years, congrats on getting debt-free! Great article 🙂 I think you make a very good point–being frugal and paying off debt doesn’t mean being a hermit. What what it does mean is that instead of going out to dinner with your friends, you might invite them to your place for a barbecue. I definitely need to work on relationships myself. Amazing work knocking out that level of debt in 2 years, very impressive! Being intentional is so incredibly important – I think if you are focused on a specific goal it becomes easier to make the other sacrifices. When I tackled my debt, I had to find ways to transition my social life from expensive outtings like concerts to more frugal but still fun options. I had a goal set of being debt-free entering my marriage since my fiancee (now wife) didn’t have any debt to her name. That was so important to me, it made all the other sacrifices easier to deal with. Thanks Scott. Yup, when your priorities and goals are clear, the decisions of what should get your attention are pretty much already made!